SYDNEY, Australia, is one of those places I usually stop at via on my way somewhere else, for me travelling from New Zealand is a hop skip and a jump across the Pacific Ocean, a total of three hours plane travel. I was heading to Sydney for the Sydney Writers’ Festival 2017, something I was excited about. 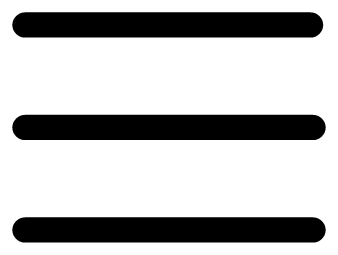 A world of resources in the shape of publishers, vibrant speakers and conferences. I arrived to the warm Aussie autumn air and tickets to a few conferences with notable speakers. I had order books from Amazon’s Createspace which were due to arrive that same week, I was hoping to hand some of them out at these conferences and events. I was staying right in the city centre in Ultimo and the trains were going to be my way of getting to and from the various events. That’s one thing that is great about Sydney is the trains, they go everywhere and the transport in general is well organised. You can get a train, costly though, from the airport into the city. Although there were plenty of options sometimes it was easier to just walk where I needed to go. The Sydney Writers’ Festival was amazing, it was held in Walsh Bay in warehouses and restaurants. There were some interesting topics of discussion and in the presentations. One discussion that I found really interesting was called, “Fighting Hislam and beyond veiled cliches”. It was based around to Muslim woman writers, and looked into the themes surrounding women’s roles in Islam. Link here This was an inspiring debate I have ever been apart of. A Palestinian woman who took the veil off who saw it as tribalism and lack of expression. An Aussie woman who wears it freely, yet both fighting sexism. We need to talk more. I was surprised at the lack of representation of Aboriginal writers in general at the festival, while there was a lot of refugees there. I know there are different awards in place and grants to encourage Aboriginal writers, but I was hoping to meet a lot more than I did. There was one guy Micheal Mohammed Ahmad who said he represented Aboriginal people and people of colour, he had just scored a big book deal and had trained many successful writers in his business called, “Sweat Shop” in the Western suburbs. While I thoroughly enjoyed my time, the discussions and the resources it really made me realise people weren’t joking when they describe the publishing industry as “cut-throat”. One incident springs to mind to serve as an example, one speaker an author who had recently scored himself a contract with a major publishing company said in one meeting, “self-publishing is for losers” and that sent one woman in the audience to tears. I was taken aback at his narrow mindedness, that comment would certainly not win him any fans — so good luck to him and his books. In response to that fact, I have actually turned down a literary agent because it was too “controlling”. I found his comment quite offensive and would refute that people who self publish are not losers! In fact I’ll bet there are many who make more money then those who get publishing contracts! Outside of the Sydney Writers’ Festival I enjoyed Vivid, which was a light show event, illuminating the various sculptures around the city centre. 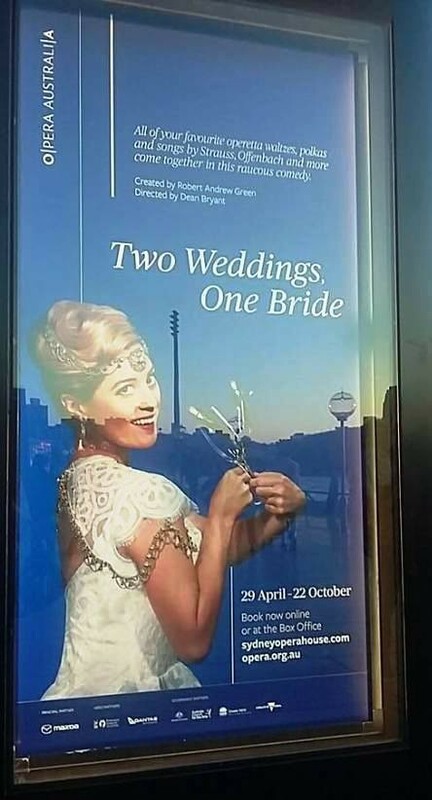 I went and saw an English-language version of an opera called Two Weddings, One Bride at the iconic Sydney Opera House (a UNESCO World Heritage site). I have seen operas elsewhere, but they were usually in French and Italian. 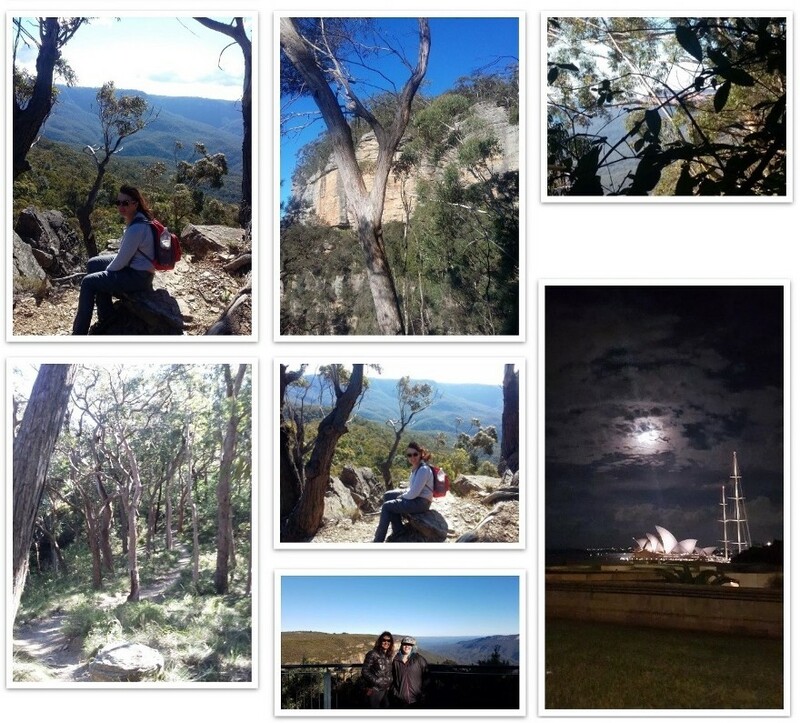 I hired a car and drove out to Katoomba where I stayed for three nights to visit the Blue Mountains. The weather couldn’t have been better and the scenery was stunning. 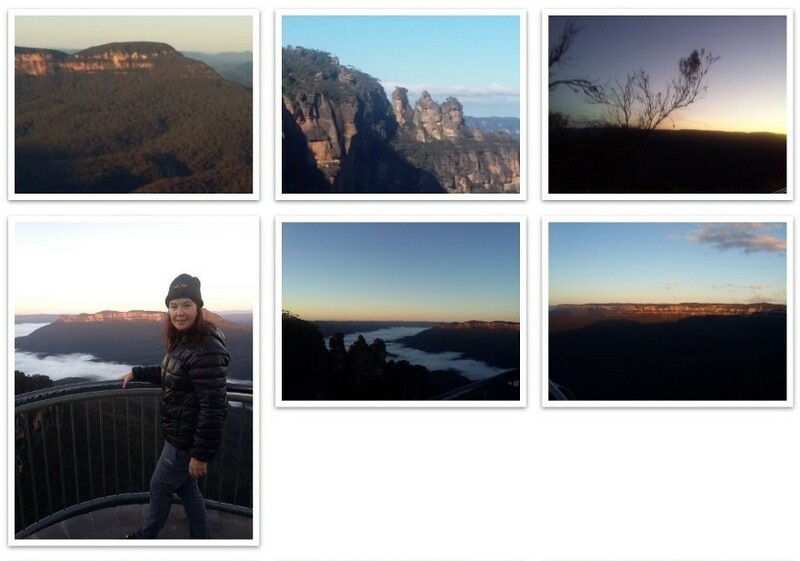 I saw the sunrise at Echo Point and saw the “Three Sisters” which are three rock formations seeped in Aboriginal mythology. The local Aboriginal people in the area were known as Gundungurra Dreaming. There were three beautiful sisters Meehni, Wlinah, Gunnedoo who once lived with the Gundungurra people in the Jamison Valley. The three sisters were in love with three brothers from the neighbouring Dharruk people but marriage was prohibited between the tribes. The brothers who were warriors and took the three sisters by force, which created a war between the two tribes. The war forced the Gundungurra people to turn the sisters into stone and since then no one has been able to break the spell and so the sisters remain rocks. I decided to walk up Mount Solitary from a place called Narrow head, all on the whim of seeing a picture of the mountain. The walk up was beautiful, a whole lot of rock climbing and steep climb but the chorus of the birds in the background was beautiful and made it enjoyable. I also met a girl from Denmark called Hanne, she’s in the photo at the bottom of the next collage with a hat and blue hair (you have to zoom in pretty close to see that), and she also took the stunning photo of the Opera House under the moonlight! Sydney is the first city in Australia to reach a population of 5 million, the largest in the country and history. 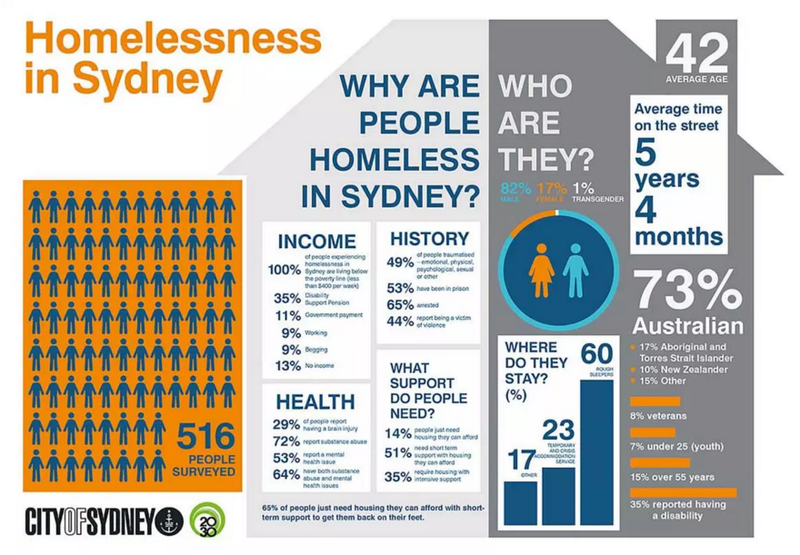 I was amazed at the number of homeless people I saw around the city and areas like Circular Quay. Australia is also the only Western country in the world that does not allow gay marriage. In the last ten years not one prime minister has seen out their full term, amazing and this was discussed as one of the topics at the writers’ festival! The cost of living in Sydney is on the horrific side, close to San Francisco in the US with an average studio room costing around $500 AU a week! Overall I enjoyed my time, had interesting experiences at my very first writers’ festival and learned a lot. Now I am catching a midnight flight 5 and a half hours to the other side of the country to Perth, Western Australia.